One of my favorite people in the world (my sister!) has a birthday in January and she happens to love PINK! 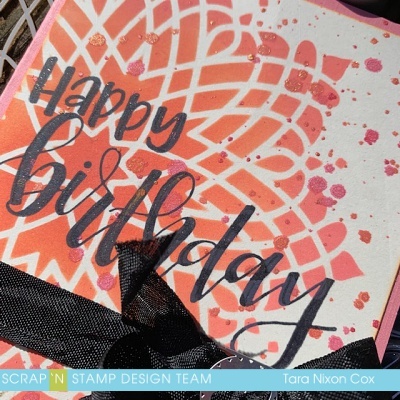 I'm mixing it up a bit with this simple card with a bit of an ombre featuring the Pantone 2019 color of the year "Living Coral" (as you can see I've used Abandoned Coral Distress Oxide Ink together with Worn Lipstick). I started the year with a card featuring The Pantone Color of the Year last year and wanted to do it again! I did some simple ink blending through this MFT Stencil "Captivating Mandala" on ivory cardstock and it's such a pretty blend of colors! I also added some shimmery paint splatters in the two colors as well to add some sparkle. 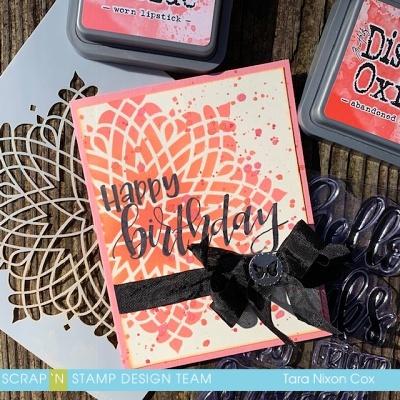 I had a few ideas of what would go on top, but decided to keep it super simple with a bold sentiment (this one from Ranger's Letter It Embossing Kit) in black ink and some pretty black ribbon to make it all pop. Here's a closer look at the card... don't you just love coral? 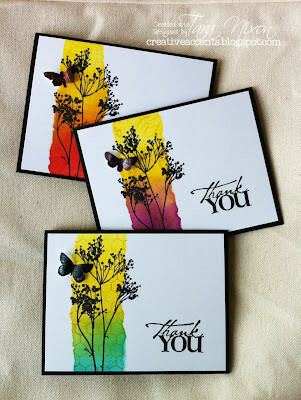 And check out the shimmer in the background and that I added to the sentiment with a Wink of Stella brush pen. So pretty!